That seems like a bold statement: Search Engine Optimization (SEO) doesn’t work. But unfortunately, the vast majority of what is passed off as SEO is actually Old School SEO – things that worked 5 and 10 years ago, but are now completely out-of-date. Old School SEO not only doesn’t work, but it is also often counter-productive. Back when Larry Page invented the idea of weighted rankings for all these new fangled things called “websites” and Sergey Brin was figuring out the math behind it, it was possible for a smart kid drinking too much caffeine to figure out how to fool PageRank, the primary driver of Google’s search algorithm for years. Today, it’s a different story. It’s no longer just two really smart Stanford grads, but 25,000 engineers working on the world’s largest codebase of 2 billion lines of code. The goal of a huge chunk of that code? Give people the best search results possible. That means that SEO consultants and SEO companies are now trying to outsmart 25,000 Google engineers. It’s not just about Larry and Sergey anymore. I think this is a good thing! Even if you invested in Old School SEO in the past, your business will be in a better place long-term. It’s no longer a war of who spends the most money on SEO (hoping they don’t cross a line that kills off your web presence), but instead who does the best job taking care of their customers. That same philosophy now applies to your website: what is good for your customers and prospects is also what is good for Google. This makes life so much easier! Google has been very direct in saying that it is a mobile first company now. They look at your website from the perspective of a smartphone. 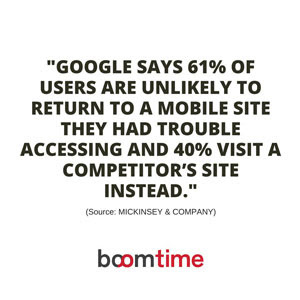 55% of all web traffic is mobile, and if your website doesn’t look great on mobile, then it doesn’t look good to Google, either. The key to being mobile ready is having a “responsive” website. This means your website changes to match whatever device your customer is using: smartphone, tablet, desktop – it always looks great. Want to know if Google thinks you’re site is mobile ready? Your listing on Google My Business (still often called Google Places page) needs to be claimed and updated with current photos and information. Unless you’re a financial advisor that is banned from asking for reviews, it’s critical to get a steady stream of reviews on your Google listing. Great content on your website that fully leverages on-site SEO is the most cost-effective way to do well on Google in the long run. This is the approach we take every time we develop a new website for a business. If you need an agency-level website in less than 60 days without the agency-level pricing, email sales@boomtime.com or call (866) 889-2945. Learn more about small business websites that drive Word of Mouth.